"Bloody Reads" is the horror-focused book club of Bucket O'Blood. I was able to attend their most recent meeting, where we discussed H.P. 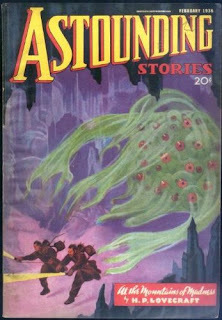 Lovecraft's "At the Mountains of Madness", first published in 1936. The novella is the firsthand account of an Antarctic scientific expedition that goes awry when the members find remains of an ancient, non-human civilization. It seems like Lovecraft's influence on modern speculative fiction is something that's being increasingly discussed and scrutinized, so it was particularly rewarding to talk about this story with a large and pretty diverse group of readers. Probably no significant spoilers below, but hey, one never knows. And, most especially, there's his technique of either delaying or refusing to completely reveal a topic. I'm sure there's some term for this, or if not, there ought to be: excessive apologizing, prefacing, claiming impossibility of description, and otherwise avoiding actually telling the anecdote in question. It can be frustrating, but it's also a good suspense & horror technique. today because of their racism. 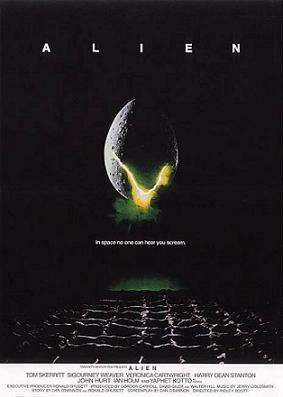 We repeatedly compared this to the first "Alien" film (1979), and how the monster works best because we barely see it. The inscrutability of the creature, the vastness of empty space, and Giger's designs also feel pretty Lovecraftian. While we scoffed pretty hard at the film as a whole, we also detect Lovecraft's influence on "Prometheus" (2012) and its ancient aliens who are malevolent and impossible to understand. We talked for a bit about how "At the Mountains of Madness" is an early and influential bit of the "ancient aliens" idea. One of the fascinating things here is the larger fictional universe that the story takes place in, including "The Necronomicon" and various bits of invented mythology and history. We had a few Lovecraft-knowledgeable folks who talked about how these tie together with his other stories, as well as works of other authors of the time. This is a pretty early example of a persistent fictional universe, and we compared it to both Tolkien's legendarium and Stephen King's recurring characters/mythology from the "Dark Tower" series and elsewhere. Lovecraft mentions a few different visual influences throughout the story, which we talked about. 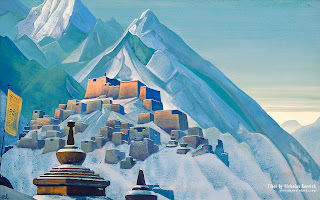 Most particularly, the mountainous landscapes of Nicholas Roerich are cited, as well as paintings by fellow weird author Clark Ashton Smith, and engravings by Gustave Doré. 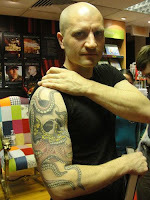 Seriously, check out his work on Dante's "Inferno". 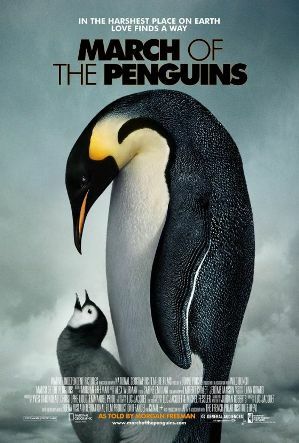 We talked for a bunch about the Antarctic setting. It's pretty fascinating from a historical perspective--that the idea of a giant geological formation like the titular mountains would actually be plausible for a reader at the time, because we didn't know that much about Antarctica in the early 1930s. That level of "unknown landscape" on Earth is just fascinating to think about today--pre-internet, pre-satellite photography, this story would read very differently than it does today. We talked about early antarctic exploration as inspiration for this novel, and also as great in its own right--especially Shackleton's account of the "Endurance" expedition. I think of that as a demonstration of the extent to which we are not yet truly post-geographical. I think that that's a demonstration of the brute being-ness of geography. And, if I had to guess, I would say that it's very, very deep somewhere...probably in the Indian ocean, but the Indian ocean is so damn big and so damn deep that it will be a long time before we find it. And even when we find it we may not know exactly what unfortunate story led it to be there. But I think of it as a rupture in our fantastic membrane of hubris. We imagine our technology as being like actually cooler than it is, and when we run into a situation in which our best techies say to us "there's nothing we can do, we can just keep looking, it may take forever, it's down in the bottom of the ocean, it's too deep to find"...it's become hard for us to get our heads around that. As a final ancient alien/Antarctica crossover, and getting back around to "Alien", we discussed the pros, and mostly cons, of the "Alien vs. Predator" movie (2004) and its ancient alien antarctic temple. In retrospect, "AvP" basically is an adaptation of "At The Mountains of Madness". Huh. With the recent prominence of Lovecraft's influence on speculative fiction, there's also been increased scrutiny and criticism of this aspect of his life & work; see for instance the World Fantasy Award's change away from a Lovecraft bust (read Nnedi Okorafor's post for a jumping-off point), or Laura Miller's article "It's Ok to admit that Lovecraft was racist". 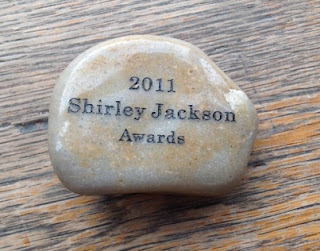 Note: The Shirley Jackson Award is perfect. Being open to talking about the negative aspects of Lovecraft is particularly important given the vast reach of his influence. We talked for a bit about the many, many authors and creators who have drawn from and built on his Cthulu mythos. I'm particularly a fan of Charles Stross's "Laundry Files" or his short story "A Colder War" (1997) for instance, and we also talked about Brian Lumley, David Ambrose, and other horror writers. We probably could have gotten on a much longer tangent about this--both those who built on the mythos during Lovecraft's life and shortly after, and those who have used it afterwards in various ways--we were probably remiss in not bringing up Frank Belknap Long or the ways that Lovecraft rivals or surpasses Tolkien in terms of providing the general understructure of much fantasy gaming and the literature & films heavily influenced by those, in turn. 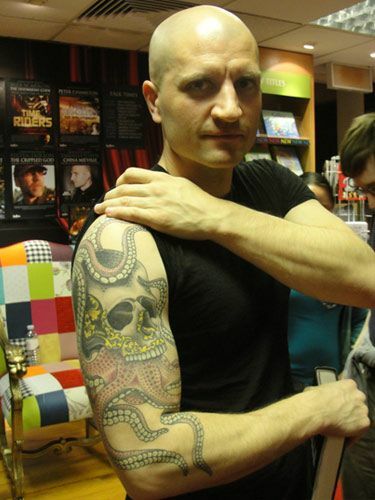 Yet another shameless plug: the China Miéville Megatext discussion is about two weeks away, and one of the many things we'll probably talk about is Miéville's relation to Lovecraft--he's at the center of the New Weird as Lovecraft was to the original Weird, and has been very vocal about Lovecraft's influence and themes, while also never hesitating to critique it. Thursday, March 24th @ Open Books. Another theme we talked about was the idea of "decadence" as an actual force that can destroy civilization, which seems kind of bonkers now. We pointed out that most "dead" civilizations were actually done in by outside forces, or didn't actually die but evolved, moved on--the idea of "moral decay" as a serious threat is kind of outdated. And yet! We pointed out that this language is still very much in use, particularly by conservative or rightist voices--the idea that "hip-hop is destroying America", kind of thing. Blech. We also brought up Mike Judge's "Idiocracy" (2006) as an example of this kind of thinking. to read "Mountains of Madness"
Lots of talk about the actual aliens here, which are so incredibly strange. There's something really fascinating about a novel that both insists that it can't really express the true horror, the horrific truth, and yet also describes its ancient aliens with such scientific rigor. We wanted to know more about how the Yeti legend is connected to interdimensional crab-fungi, which doesn't seem super...Yeti-like. And we thought the ease with which our narrator decodes the alien murals pretty funny. And we were fascinated with the idea of humans as kind of superfluous--part of the horror here coming from how unimportant we are to this grand tale of cosmic war and decline, that we're just kind of accidentally-evolved garbage. In some ways, this feels to me like the extreme endpoint of a certain strain of naturalist writing--that the universe doesn't ultimately care about humans, as early people thought (geocentrism etc.). And I know others have connected Lovecraft to the general modern reaction to World War I. Another question we had was why Lovecraft is having such a resurgence. While a few of us were long-time fans, many of us were reading Lovecraft for the first time, and even more of us confessed that we had read/watched/played a lot of stuff heavily influenced by him before ever encountering his work directly. We noted that Poe, for instance, does not seem to be having the same sort of cultural renaissance that the Cthulu mythos is (and also talked about "Arthur Gordon Pym", Poe's 1838 novel that Lovecraft references here). Lot of interesting thoughts here about the openness/versatility of this world-building from day one, the rise of the morbid weird (like Slenderman & other creepypasta), and also the vibrant "New Weird" genre in its many forms--folks like the VanderMeers have been instrumental in bringing Lovecraft & his contemporaries as well as current weird writers to a receptive audience. A really fun discussion! Bloody Reads will next meet to discuss Ira Levin's "Rosemary's Baby"; you can find out about more updates on the Bucket O'Blood Facebook, and those and other horror-related events on the Chicago Horror Meetup.